For newcomers to the cryptocurrency space, it may be difficult to explain the differences between certain digital currencies. Ethereum and Bitcoin are the two most prominent players in the space, and have the highest market capitalization values. Bitcoin was the first digital currency to ever be successfully adopted by society and show that secure P2P transactions between trustless parties, without the need for a third-party intermediary, could be achieved. Perhaps most importantly, Bitcoin introduced the concept of the blockchain. Without blockchain technology there would be no cryptocurrencies, which means that this introduction is what paved the way for Ethereum to be created. Bitcoin’s scope of use is very limited – in that it can only be used to send value back and forth. The blockchain itself has much more capability than this simple application, and Ethereum is the first cryptocurrency to create a truly revolutionary platform based on the blockchain. This application came with the invention of smart contracts – a digital, self-enforcing, immutable programmable set of rules and conditions that binds all parties involved. A smart contract can automatically execute and turn any paper contract into a digital “lawyer” of sorts, allowing parties to enter into a bet, transaction of services, and more without the need for a written contract or third party of any kind. Smart contracts have the capability to remove the need for third party interference throughout every aspect of our society. When Bitcoin was first introduced in 2009, the world was unsure how to react. This new digital currency offered a way for ordinary people to conduct transactions outside of any third party regulation. It showed how efficient a transaction could be, in addition to inventing a new mode of recording these transactions and improving privacy and security. 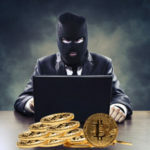 This new “currency” had a volatile childhood, with its use mainly being associated with black market affairs on the silk road – the world’s first darknet black market that operated using Bitcoin transactions. As we discussed earlier in the article, the fundamental innovation that Bitcoin provided was not so much the idea of a digital currency, but the blockchain infrastructure that supports it. The blockchain instantly sparked the imagination of creative minds across the world, as it introduced a new method of recording transactions and securing personal data and information. Thanks to the blockchain, it was no longer necessary for a transaction to require a bank or trusted third party to approve of and record a transaction. Rather, transactions would automatically be recorded on “blocks” within a chain and be verified by miners and computers that are distributed across the globe. It was now possibly to engage in an exchange of value easier, safer, and more efficiently than ever before. This innovation is what laid the groundwork for Ethereum to be born. While Bitcoin provides a digital currency that can be exchanged, there was no way to engage in more complex deals that require legally binding logic without bringing in a third party. 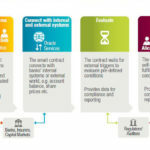 Enter Ethereum and smart contracts, a platform that invented a digital version of a written, legally binding agreement. These smart contracts can program legally binding logic and terms into a digital agreement, and then can be executed by the activation of external sensors, or “triggers” that enforce what is outlined in the contract. Ethereum is the platform for which projects can be established and create use cases and unique contracts that serve their vision. For example, smart contracts could allow for a platform to be created where anyone in the world could place trustless bets without the need for a bookie or bookkeeper. The smart contract would enforce the rules, collect the money, and immediately send the profits to whoever wins the bet. This is all done automatically and through triggers set throughout the internet and blockchain – whether it be checking scores on multiple websites or verifying funds. Smart contracts are the key innovation and difference between Ethereum and Bitcoin. They complemented the original revolutionary blockchain technology that Bitcoin implemented, allowing for these secure and P2P transactions to also incorporate contractual logic, allowing for much more complex systems of payment to be created without the need for any third party to leech value. 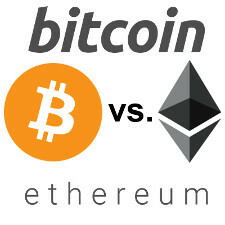 Bitcoin simply allows for the exchange of Bitcoin (BTC), while Ethereum provides a platform for creatives to develop their own use cases for smart contracts. It allows for any kind of smart contract to be programmed using their coding language Solidity, giving the community the power to use this powerful technology in any way they see fit. Ethereum also contains its own currency, called “Ether”, that represents the “gas”, or computing power that enables smart contracts to be verified and automatically executed by the network. So, if Ethereum has so much more use and potential to change the way society operates, why is Bitcoin worth so much more? The answer is scalability. Bitcoin is the most recognizable name for newcomers to the space, and it was the first to introduce blockchain. It is the most immediately usable form of digital currency, but its use cases do not poise it to be able to help out businesses in very many ways moving forward. Ethereum has been able to show how its technology can revolutionize the world, but such an enormous undertaking requires a similar amount of scalability. Ethereum may be able to surpass Bitcoin if the decentralized applications (DApps) and companies on its platform are able to achieve mass adoption, something that is being worked on as we speak. Currently, transactions are just too slow, and the network becomes bogged down by massive traffic, a problem that would be compounded if a DApp gained millions of users. Still, Ethereum has been making moves to improve its scalability. Recently, they unveiled the Metropolis update. This protocol improvement switched the method of verifying transactions by miners from proof of work (which Bitcoin uses) to proof of stake. This had multiple benefits, including a faster transaction time, less energy required to verify transactions, and new way for miners to be incentivized to participate. Now, Ethereum has shown that it is consistently working to enable its participants to effect real change. Bitcoin is the grandfather of cryptocurrency, and because of its notoriety, long lifespan, and its introduction of the blockchain, it is the most valuable currency available today. Ethereum has proven its versatility and application to society is superior to Bitcoin, but until they can prove the use cases to the masses and the ability to scale them appropriately, they will continue to trail Bitcoin in value. Will Cryptocurrency Ever Compete with Fiat Currency?